Singapore tops the list of Asian investors in the property sector in the United States, the UK and Australia. China investors have been the second-largest in the three countries over the last two years, according to property consultancy Knight Frank. 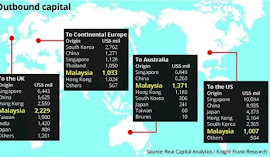 Malaysia is the third-largest investor in Australia and the UK, with the United States and continental Europe being less favoured. Over the last 24 months, Asian investments into the United States, the UK, Australia and continental Europe totalled US$78.4bil. South Korea tops the list of property investors to continental Europe. In its Global Cities: The 2016 Report, Singapore’s total investments to the UK, the United States, continental Europe and Australia totalled US$25.10bil, with the United States taking the bulk of it. China has a total of US$22.09bil, with the United States being its favourite. Malaysia’s investments totalled US$5.61bil, with the UK receiving US$2.23bil. The period of this outbound capital was between the third quarter of 2013 and the second quarter of this year, said a Knight Frank statement. Executive director James Buckley said Malaysian real estate investments abroad had been “incredibly active” over the last five years, but is expected to slow down as a result of the weakened ringgit relative to other currencies. “There is a strong desire from Malaysian investors to diversity their wealth into overseas markets. 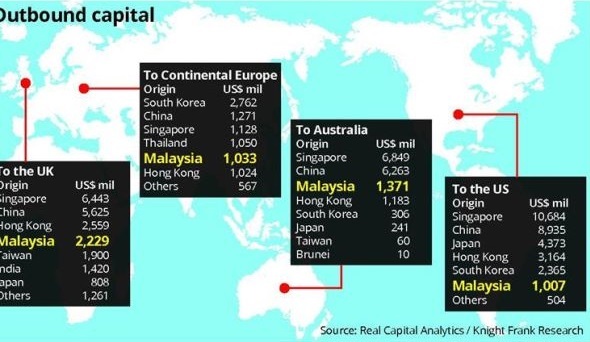 There has been a slight shift in outbound capital, with Malaysian investors focusing more on the Australian market compared with the UK. This has largely been driven by the value of the Malaysian ringgit relative to the Australian dollar, which has weakened 6.6% versus 24% relative to the pound sterling,” Buckley said. He said while Malaysians are diversifying their assets abroad, the weak ringgit, down about 25% to the US dollar at a 17-year low, had also spurred interest from the Taiwanese, Japanese, Singaporeans, Middle Easterners, Germans and the French. Buckley said they are interested in budget to five-star hospitality assets and quality office space. He said Kuala Lumpur is one of five cities to watch, as foreign developers and institutional investors see real estate opportunities here. The fact that Canada Pension Plan Investment Board (CPPIB) is in a joint venture (JV) with low-profile property baron Tan Sri Desmond Lim of the Pavilion/Malton group to develop Pusat Bandar Damansara (PBD) in Damansara Heights has put Kuala Lumpur on the radar, Buckley said. “The Canadian pension fund in PBD opened up a lot of eyes. The perception is, ‘Okay. Such a big fund is here. There must be something here’. It will pave the way for more funds to look for similar transactions,” said Buckley, adding that foreign investors are looking for investments valued at between US$100mil and US$300mil. “Like any new investors, their interest will be Kuala Lumpur,” he said. “The fact that Lim’s offices are 60% pre-leased at between RM7.50 and RM8.50 per sq ft, with a 95% occupancy expected within 12 months of opening, is commendable,” said Buckley. The average rental in Damansara Heights is between RM4 and RM4.50 per sq ft.
CPPIB has a 49% stake in the JV with the Pavilion Group, or an investment of RM485mil, in Lim’s mixed integrated development. On calls by certain parties for Malaysian funds to sell their overseas assets which they had bought over the last five years to help shore up the ringgit, Knight Frank Malaysia managing director Sarkunan Subramaniam said: “Even if they (the funds) do bring back their money, what is the asset class investment here that can provide that long-term security they are getting in the markets they have already invested in? I can’t think of any. “And the investments they have abroad are ‘upward only’ rent revisions. To bring it back here means leases of three-plus-three-plus-three years,” Sarkunan said.